In Debt and Development Stuart Corbridge offers an exciting new approach to the study of both debt and development, focusing on the international debt crisis of the 1980's and 1990's, and it's economic and geo-political consequences. Moving far beyond the framework of a narrative account, the author demonstrates that interpretations of this crisis - and attempts to manage it - are themselves reflections of wider assumptions about the dynamics of development and the organization of the global economy. Part I sets out to provide the 'standard narrative' of the debt crisis from the OPEC oil price rises onwards, ending with the most recent attempts at crisis management. After establishing, as much as is possible, the facts of the crisis, the author then provides in part II a demonstration of how this crisis might be interpreted from three quite different perspectives: a free market 'system stability' approach; a Keynesian 'system-correction' approach; and a Marxian 'system instability' approach. 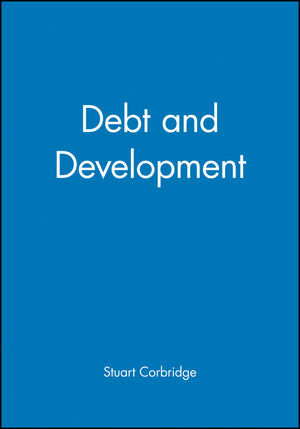 In a conclusion, the author considers how these competing perspectives on debt and development might be judged. Based on wide teaching experience in the field, Debt and Development will be welcomed by students and teachers of geography, developmental studies, economics, international relations and political science. Stuart Corbridge is University Lecturer in South Asian Geography and Fellow of Sidney Sussex College, Cambridge. He is the author of Capitalist World Development (1986) and an editor of Money, Power and Space (Blackwell 1993). He has previously taught at the University of London and Syracuse University. Part I: Describing the Debt Crisis-A Standard Narrative Account:. Two: The Debt Crisis: a Standard Narrative Account. THE DEBT CRISIS TAKES SHAPE. 6. Containment, Adjustment and Austerity. 7. The Baker Plan: Adjustment with Growth. 8. Brady and the Market-menu Approach. Part II: Decoding the Debt Crisis: Discourses on Debt and Development:. Three: The Debt Crisis: A system-stability Perspective. 2. Subjective Perspectives, Invisible Hands and Spontaneous Orders. 3. The Counter-revolution in Development Theory and Policy. 4. The Debt Crisis: Two System-stability Models. 5. Policing the Debt Crisis. Four: The Debt Crisis: a System-correction Perspective. 5. Policies for Debt Crisis Management. Five: The Debt Crisis: a System-instability Perspective. 2. Marxism and Radical Political Economy. 4. Debt and Development Crisis.